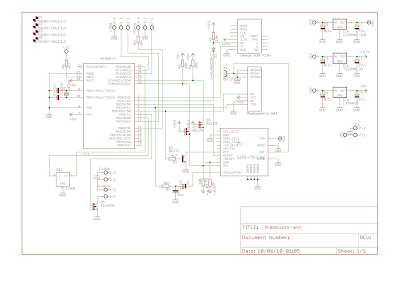 Also check out this pin mapping reference between the Arduino and the Atmega328P. I wanted the option to use both the Radiometrix HX1 and SRB MX146 radios, so I wired them both, but only one can be really used at a time. As you can see, the connection from the AVR chip to the HX1 is straight-forward, just wires and no additional components. The MX146, however, requires a couple of BS170 mosfets to translate I2C's TTL 3.3 <-> 5v levels, a transistor to drive the PTT and a voltage divider to convert the audio input down to 500 mV peak-to-peak. The MX146 also has its own 8V regulator, since I've got the 8V version. You can absolutely leave these components out if you're only going to use the HX1. The GPS is a Venus 634FLPx. I bought it from Sparkfun. Since this is a 3.3V device, it needs some level conversion (via the diode method described here) and its own 3.3V regulator. I also added a couple of LM60 sensors, since I want to measure both on-board and external temperatures. The external sensor can be connected via a terminal block (X2). I also planned for a capacitive humidity sensor (X3), but I don't think I'll use it on my first flight. A MOSFET 22nf031 controls the "suicide" mechanism that cuts the rope if the balloon somehow refuses to burst. It has its own power source (X5) to avoid draining the main Vcc, and the nicrom wire goes to yet another terminal block (X6). Lastly, X7 is the main Vcc source, coming from a pack of lithium AA batteries. I have the Eagle .sch file and libraries for the MX146, the Venus GPS and the HX1 if anyone is interested. Next step: create the .brd file for a PCB house. I'm really struggling with this, since it must match the PCB house specs (I'm thinking Olimex).